Installing Category 5E Ethernet isn’t too tough of a job, and with the right tools it becomes a picnic in the park. 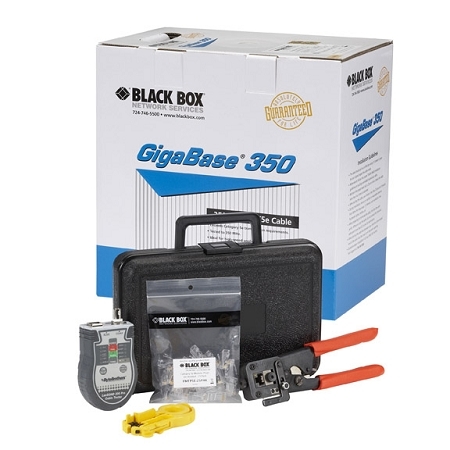 The BlackBox Cat5e Installation Kit is a comprehensive set of tools for cutting, stripping, terminating, and testing twisted pair CAT5e network cables. Perfect for contractors and IT technicians, not only are all of these available tools compliant with TIA/EIA component and performance standards, but the kit includes 1000ft of spare cable to use as one wishes from job to job. This means you can complete cable runs or create patch cords if necessary. 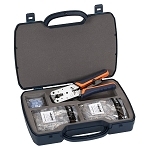 To protect the tools from damage, a hard case comes with the purchase of the Black Box Cat5e Installation Kit. For a full list of all of the tools inside this kit, please click the "Specifications" tab. For additional knowledge about the kit, please click the "More Information" tab. Dimension 3.37" x 4.86" x 2.1"